The following guidelines are required for us to send your artwork to print. If you are not able to correctly submit your artwork we are here to help you! Contact us with all graphic design questions. All graphics must be sent as a Photoshop or Illustrator file. A JPG taken from Google will NOT work for screen printing. A) At 300 dpi or Vector Format. 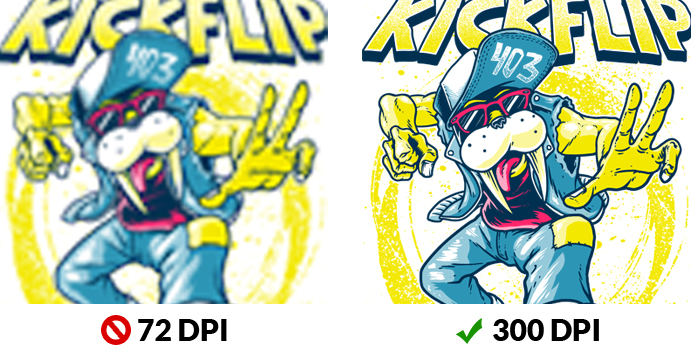 Please don’t just take a 72 dpi image into photoshop and increase the resolution. If it wasn’t created at 300 dpi the image will be blurry & unusable. C) The dimensions of the images saved as large as you would want it printed.